Cornu aspersum (O.F. 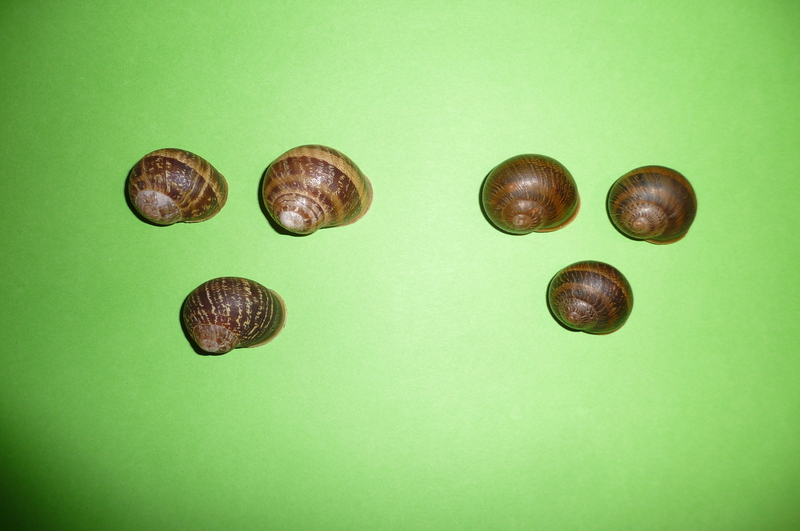 Müller, 1774) is a common European snail with a ground colour of yellowish brown , and mostly with some darker spiral bands and irregular light and dark blotches (Jansen, 2015). Recently in a Dutch zoo a new tropical greenhouse was installed with plants imported from Costa Rica. Herman Creemers sent me a picture of snails collected in this greenhouse (on the right side), together with some specimens from the Netherlands (on the left side). He wondered if this species was known from Costa Rica or not. 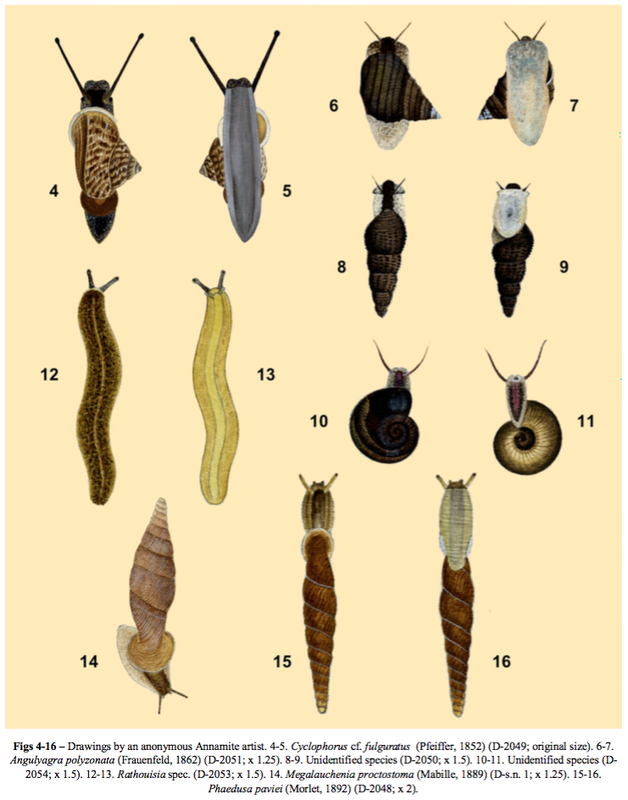 Barrientos (2003) has given an overview of Costa Rican species and said: “El escargot, Helix aspersa [the old name], fue introducido has más de 100 años y está restringido a jardines urbanos en San José”; the species is thus more than a century present in Costa Rica, but still restricted to gardens in the capital. The different coloration of shells presumably originating from Costa Rica, imported together with plants, is somewhat different. This might be due to the prolonged isolation, but only detailed DNA research could tell whether some divergence has occurred or not. Barrientos, Z., 2003. Estado actual del conocimiento y la conservación de los moluscos continetales de Costa Rica. – Revista de Biologia Tropical 51, Supplemento 3: 285–292. Jansen, A.W., 2015. Veldgis slakken en mossels. Zeist, KNNV, 272 pp. This entry was posted in Uncategorized and tagged costa rica, helicidae, introduction on September 26, 2016 by bramb. 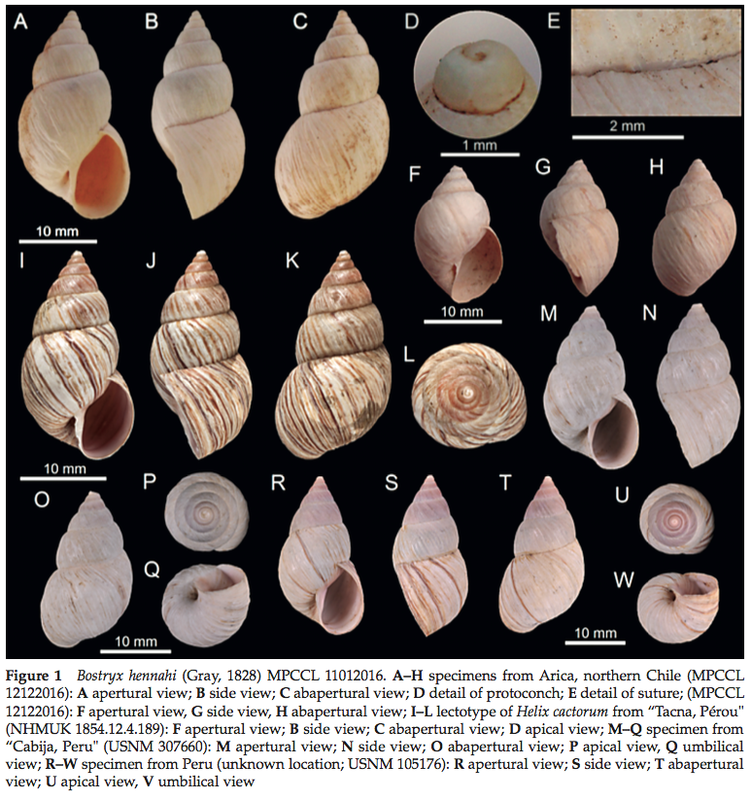 Freshly pressed (but in bytes only): a new paper on the drawings of Vietnames land- and freshwater snails that was found in the Bavay archive, and the person who initiated this. We have added biographical data and a list of eponyms of Victor Demange, who was a contact of Bavay. This entry was posted in Uncategorized and tagged biohistory, publications, varia on September 25, 2016 by bramb. The borders of a discipline are often quite interesting, also because less research has been done and one can try out novel approaches. Some time ago I did this with the project on snails in art, and this time I ventured to explore the social sciences to get more insight in the history of malacology. Last week I crossed the border in a double meaning, not only to the domain of the social sciences, but also to Germany where I participated in the 10. 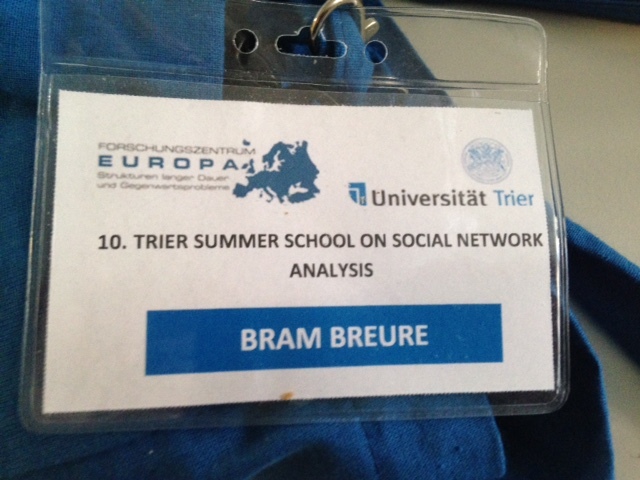 Trier Summer School on Social Network Analysis. As I have elaborated here, malacologists operate (and have operated), like all scientists, in a social network. The question is what research questions are possible, especially when focussing on the 19th and early 20th centuries? For a better understanding of how malacology as a discipline developed, it would e.g. be interesting to understand how the links between malacologists in the past were functioning (see here), and who played an important role or acted as a broker between different parts of the network. But the question is how to reconstruct these links from the past that tied together the malacologists in an ancient science network. Since historical research depends on the quality of the data sources, I was happy to have had access to the Dautzenberg archive (Breure, 2015, in press), and to work on the Crosse archive. This allowed for a validation of the idea that eponyms are a proxy for contacts between malacologists. Eponyms have been given, especially during the 19th and early 20th centuries as a tradition, to collectors providing material and to collegial authors. The validation process (Breure, in preparation) proved to confirm the idea that eponyms may act as a proxy for contacts, provided that contextual information is used. The figure above is the result of gathering the eponyms given and received by six French malacologists: Crosse, Drouët, Mittre, Morelet, and Petit de la Saussaye. 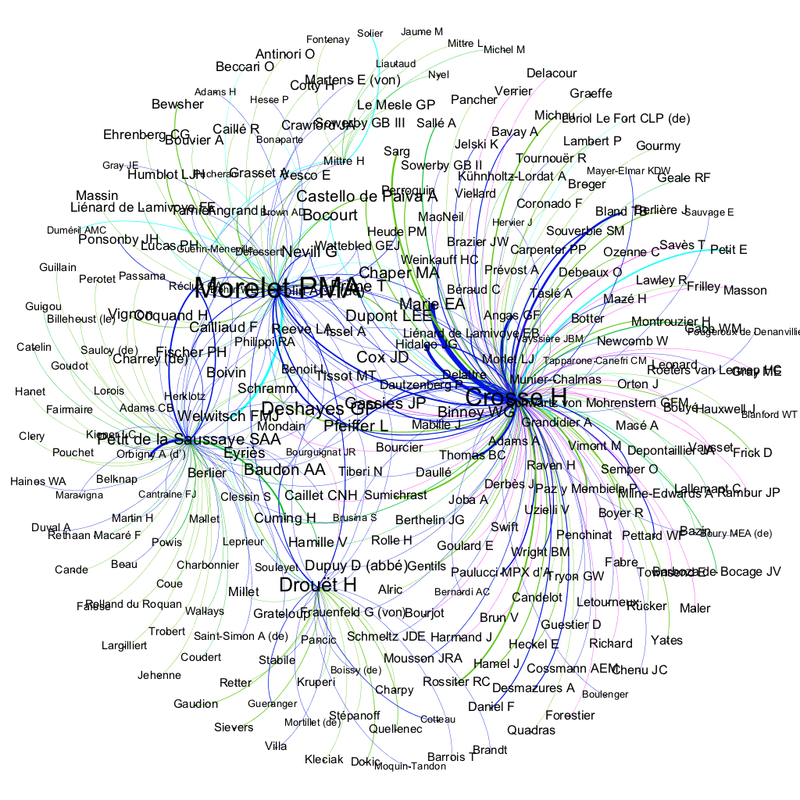 The size of the name reflects the importance in the network, as calculated by statistics in Gephi. Interesting is that Morelet is the most important person in the network of six, and not Crosse as one might have expected. Breure, A.S.H., 2015. The malacological handwritings in the autograph collection of the Ph. Dautzenberg archives, Brussels. — Folio Conchyliologica 33: 1–111. This entry was posted in Uncategorized and tagged biohistory, eponyms, social network analysis on September 23, 2016 by bramb. In the latest issue of the Journal of Conchology a paper appeared by Araya et al. about the occurrence of Bostryx hennahi (J.E. Gray, 1828) in northern most Chile and southernmost Peru. This species appears confined to fog oasis in the extreme arid deserts in the region, and is thus an example of a harnessed species to harsh conditions. Araya, J.F., Madrid, M. & Breure, A.S.H., 2016. Bostryx hennahi (Gray, 1828) the largest Chilean bulimulid (Mollusca: Pulmonata) rediscovered among Tillandsia communities in northern Chile. — Journal of Conchology 42: 161–165. This entry was posted in Uncategorized and tagged bulimulidae, chile, peru, publications on September 7, 2016 by bramb.